Pom pom trims are fun to use at the bottom of a dress, or at the ends of the sleeves for example a blouse. It gives your clothes a cheerful, unique finish and look. 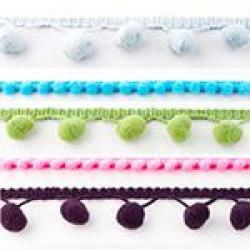 Pom pom trims are also good to use for decorative purposes. You can order them in different sizes, colors and widths per meter. Pom Pom Trim 5mm - Black..
Pom Pom Trim 5mm - Dark Blue..
Pom Pom Trim 5mm - Choco..
Pom Pom Trim 5mm - Purple..
Pom Pom Trim 5mm - Red..
Pom Pom Trim 5mm - Fuchsia..
Pom Pom Trim 5mm - Fluor Pink..
Pom Pom Trim 5mm - Dark Grey..
Pom Pom Trim 5mm - Sand..
Pom Pom Trim 5mm - Apple green..
Pom Pom Trim 5mm - Lime..
Pom Pom Trim 5mm - Fluor Green..
Pom Pom Trim 5mm - Orange..
Pom Pom Trim 5mm - Fluor Orange..
Pom Pom Trim 5mm - Yellow..
Pom Pom Trim 5mm - Fluor Yellow..
Pom Pom Trim 5mm - Cobalt..
Pom Pom Trim 5mm - Aqua..
Pom Pom Trim 5mm - Light Blue..
Pom Pom Trim 5mm - Pink..